In typical bad boy fashion, the first time Hannibal makes an appearance, he jumps on his motorcycle, wearing all black. And in typical bad boy fashion, he's hard to resist. He has really taken off now, and with no secrets left, his load is lightened. Everyone close to him (which is really only Will and Bedelia) knows who he is, and the audience does, too. When the characters look straight into the camera, the viewer, like Bedelia, becomes implicated --are you observing, or are you participating? We know Hannibal's darkness, too, and we aren't turning away. We are leaning in closer. Hannibal and Bedelia have relocated to Italy after their great escape last season. To hide in plain sight (as is Hannibal's way), he has taken the identity of a professor -- after having him for dinner, of course. Bedelia is living with him as his wife, and while she knows most of what Hannibal is doing, it's unclear how voluntarily she participates. She tries to escape multiple times, once by gliding underneath her bath water and imagining a slow descent into nothingness and once by packing her bags and attempting to run. 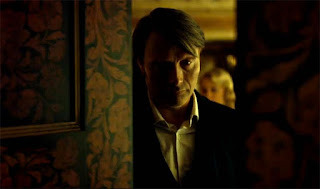 But Hannibal's darkness has surrounded her, and she is trapped both by his mind and by the elaborately decorated door in their Italian flat. Europe has only elevated the setting of Hannibal, which was already beautiful. Florence and Paris are both grandiose, and the house Hannibal chooses to live in is simply stunning. Like his previous home, it is decorated so beautifully it would be blinding to those who enter. Who could see anything ugly hiding in something so grandiose? And Bedelia is another perfect ornament, adding beauty to his deception. Gillian Anderson is phenomenal as Bedelia. Her icy exterior is cracking, and her panic and despair show in her eyes and the way her voice breaks. Her hands are steady enough, though, and when she points a gun at Hannibal while he's getting dressed in their shared home, she looks as though she aims to kill. While she trains her gun on Hannibal, she asks questions that I'm dying to know: what has Hannibal done, is Will Graham alive, will Mads Mikkelsen stay undressed? (We don't know, probably, and sadly no.) While the show's dialogue has deserted subtlety almost entirely ("Hannibal would love to have you for dinner"), Gillian Anderson's performance is heartbreaking in her quiet fear. Bedelia puts her gun down eventually, but Hannibal's weapon of choice has never been a firearm. He uses his mind to trap his bait, and it's all he needs to keep Bedelia close to him. The next time Anthony crosses Hannibal's path, he isn't so lucky -- and neither is Bedelia. Both Anthony and Bedelia attend a lecture by Hannibal where he speaks of Judas Iscariot. (Does Bedelia flinch when she hears of Judas's betrayal?) Anthony arrives late, but Bedelia tries to leave early. She runs down a winding, fairy tale staircase, right into a nightmare. She packs her bag and tries to head out the door of her apartment, right before Anthony and Hannibal walk back in. Anthony figures out Hannibal isn't who he says he is. And like others before him who have reached the same conclusion, Anthony pays for his cleverness with his life. Bedelia is only left alive because Hannibal isn't finished with her yet. As Bedelia says herself, if you think you are about to catch Hannibal, it's because he wants you to think that. She might think she can escape his world, but that's just a part of his plan. There is no word yet on the fate of Jack, Will, Abigail, or Alana. Hannibal and Bedelia were so fun to watch, and their story so rich and full, that I almost didn’t miss the friends they left behind. 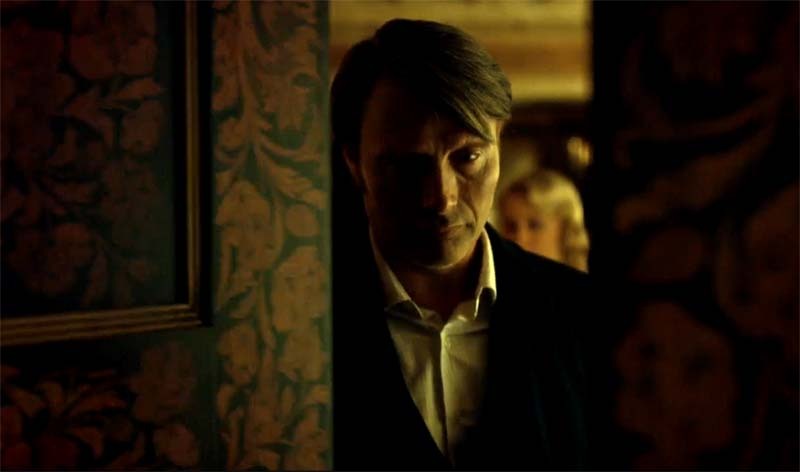 There are flashbacks, just not to the horrific scene Hannibal walked out on last season. We do, however, learn more about Bedelia’s incident with her patient and what happened to dear Abel Gideon. Bedelia seems intent on seeking out policemen and security cameras. Is it so she could be prepared if she runs, or just to remind her that someone out there is supposed to be keeping her safe? This episode is named “antipasto,” which is the traditional first course of a big Italian meal. Traditional antipasto could include cured meats, artichoke hearts, and vegetables. I'll see you next week! Until then, you can find me on Twitter at @rclnudson. Thanks for your review. I´m agree with you that it was very fun to see Hannibal and Bedelia together. It was like they explain to us why she take the plane with him. I didn´t miss the rest of the cast in this episode, but i want them back in the second one. This episode was so beautiful and with so much horror...that i understand Bedelia. I think she is divided beatween the horrible thinks Hannibal is doing and the atraction she feels for him. And don´t know if she really want to scape from that setuation. Gillian is doing so amazing work with this carácter and i hope they going to give us so incredible arc this season for her... only if Hannibal don´t eat her. I´m sorry for my english but i´m writing from spain, and i´m doing and incredible effort to explain myself, because i really like your reviews. Your comment is great, thanks so much for posting it! I will be SO upset if Hannibal eats Bedelia! I also am excited to see everyone else in the next episode and how they were affected by Hannibal. And to see who is alive! Thanks for reading along!